The Center conducts regular “brown-bag” lectures and public seminars on topics related to the Philippines and Filipinos. It has presented more than 500 speakers to date. The lecture series is intended to promote intellectual interest and interaction within the University community, particularly among Philippine specialists. It also serves as a forum for distinguished Philippine specialists, intellectuals, officials, and other visitors who are invited to speak. Among them have been former Senators Leticia Ramos Shahani and Arturo Tolentino, former Senate President Jovito Salonga, former University of the Philippines (UP) President Jose Abueva, Dr. Doreen Fernandez, Dr. Carolina Hernandez, Dr. Mahar K. Mangahas, the late writers Salvador P. Lopez and Bienvenido Santos, famous author N. V. M. Gonzalez, noted novelist and 1980 Ramon Magsaysay awardee for Literature, Journalism, Communications F. Sionil Jose, historian Reynaldo Ileto, and Prof. Jose David Lapuz. The Center sponsored the first Asian-scholar-in-residence at UHM, Dr. Bienvenido Lumbera, UP professor of literature and Filipino, who likewise won the Magsaysay Award. It also sponsored two Distinguished Florence Macaulay Lectures, bringing to the campus Prof. Solita Monsod of the UP School of Economics and Ms. Monalisa Yuchengco of the Yuchengco Group of Companies. In Spring 2012, it hosted Resil Mojares for the Andrews Professorial Chair. “Ambiguous Belonging: Race, Citizenship and Filipinos in the US Empire,” by Katrina Quisumbing King. Date & time: April 18, 2019, 3:00-4:30pm. Venue: Tokioka Room, 1890 East-West Road, Honolulu, Hawaii (University of Hawaii at Manoa). Please click on past lectures in our archives Colloquium Series, 2000-2014. “Finding Our Heroes,” by Marie Silva Vallejo. Date & time: Nov. 29, 2016, 11:45am-1:15pm, Venue: Moot Courtroom, William S. Richardson School of Law, 2515 Dole Street, University of Hawaii at Manoa. 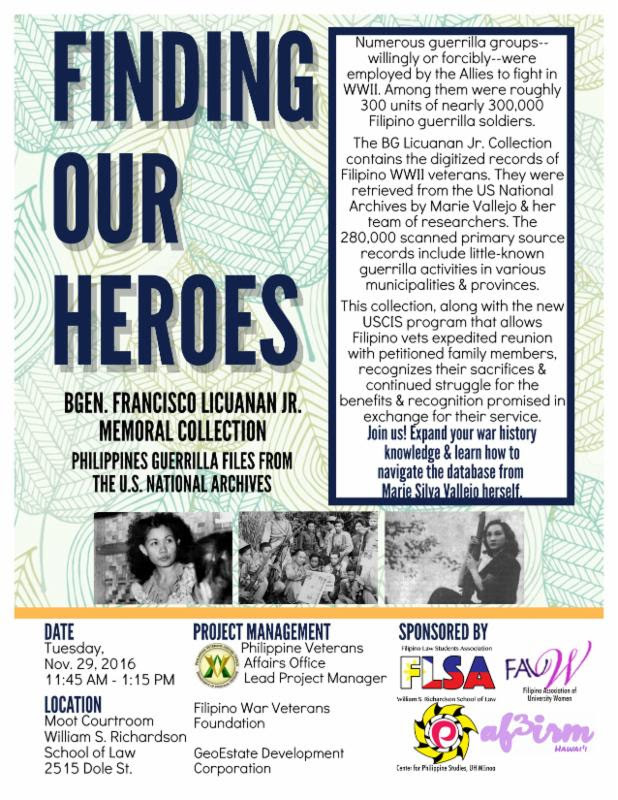 This is a presentation on Filipino soldiers during WWII based on the the archives mined from the National Archives, Washington, D.C. For details, see flyer . “An Evening with Grace Nono,” Date: June 6, 2016, 7:00pm-8:30pm, Venue: Doris Duke Theater, Honolulu Museum of Arts. Jointly sponsored by the UH Center for Philippine Studies and community partners (Decolonial Pin@y and University of the Philippines Alumni Association of Hawaii). “Countering ISIS Threat among Muslim Youth,” by Datu Mussolini Lidasan, Monday, May 2, 2016, 1:00-3:00 pm, Moore Hall 319 (Tokioka Room). Please come, listen and participate in this presentation to understand more why Islamic radicalism seems to be on the rise in the southern islands of the Philippines. Details at: Lidasan_Lecture-ISIS-Threat. Mussolini Lidasan is the Director of Ateneo de Davao University’s Peace Center. The Bangsamoro Agreement and the Status of the Peace Talks in the Philippines, by Jose David Lapuz, June 3, 2015, Wednesday, 11:00am-12:00pm, Paradise Palms Cafe. Sponsored by the Center for Philippine Studies. Free and open to the public. ‘Utility Men’, Servitude, and Youth Unemployment in the Philippines, by Dr. Roderick Galam, March 18, 2015, Wednesday, 3:00-5:00pm, Webster 203. Co-sponsored by The University of Hawai’i at Manoa Ilokano Program, The UH Manoa Filipino Program, & The Center for Philippine Studies. 73rd Anniversary of the Invasion of the Philippines/Pearl Harbor, by Cecilia Gaerlan and Domingo Los Banos, December 5, 2014, Friday, 2:00-4:00 pm, Center for Korean Studies Auditorium. Co-sponsored by the Bataan Legacy Historical Society, Filipino Language and Literature Program, and Center for Philippine Studies. Puzzling Paradoxes in Philippine Feminism, by Dr. Belinda A. Aquino, Professor Emeritus & Founding Director, Center for Philippine Studies at University of Hawai’i at Manoa. November 21, 2014, Friday. 12:30-2:00 pm, Saunders Hall Room 637. PInay Cultural Bearers of the Filipino Diaspora, by Virgie Chattergy, Professor Emeritus UHM College of Education, co-sponsored by the University of Hawaii, Hamilton Library. November 16, 2014, Sunday, Starts at 1:00 pm, Hamilton Library, Room 301. Philippines-US Relations: Reflections and Perspectives on an Enduring Alliance, by Gina A. Jamoralin, PhD, Consul General, UH Manoa Center of Philippine Studies, October 15, 2014, Wednesday, 3:30-6:00 pm, Moore Hall 319. Colonial Debt Among Filipinos and Chamorros and Implications on Research Regarding Acculturation and Attitudes Toward U.S. Militarization, by Francis Dalisay, PhD, Assistant Professor, UH Manoa School of Communications, February 4, 2014, Tuesday, 12:00-1:30 pm, Moore Hall 319. Restoring Separation of Powers and Constitutional Accountability: Dismantling the Pork Barrel System through the Philippine Supreme Court, by Prof. Diane A. Desierto, Assistant Professor, Richardson School of Law, February 5, 2014, 1:30-3:00 pm, Moore 319 (Tokioka Room). A detailed account of Prof. Desierto’s lecture is provided by Alden Alayvilla Here. Cultural Identification as a Protective Development Factor for Filipino Youth in Hawaii and Exploring the Challenges and Motivations of Filipino Students in Pursuing Health Careers – Two Potential Collaborative Projects, by Dr. Anthony Guerrero and Dr. Gretchen Gavero, Department of Psychiatry, John A. Burns School of Medicine, UHM, February 20, 2014, 12:00-1:30 pm, Moore Hall 319. Filipinos and Education in Hawaii: Challenges and Opportunities, by Jon Okamura, PhD, Ethnic Studies Department, and Patricia Halagao, PhD, College of Education, October 16, 2013, Wednesday, 2:00-4:00 pm, Moore 319 (Tokioka Room). Dr. Okamura will talk on “Filipino American Access to Public Higher Education in California and Hawaii.” In 1998, Filipino American students joined African American and Latino students in a class – action lawsuit that charged the admissions policies of the University of California, Berkeley violated federal antidiscrimination laws. Two years earlier, California voters passed Proposition 209 that prohibits race – based affirmative action in college admissions. In 1996, the University of Hawai’i Board of Regents approved a 50 percent tuition hike and another 23 percent increase for the following year. Okamura’s presentation compares the impact of those policies on the admissions and enrollment of Filipino American undergraduates in the UC system and the UH Manoa since 1996. Migration, Elections, and Muslims: A Symposium on Mindanao, by Faina A. Ulindang, PhD, Samuel E. Anonas, PhD, and Jamail Kamlian, PhD., November 23, 2013, Saturday, 2:00-4:00 pm, at the Philippine Consulate General Lanai, 2433 Pali Highway. Light merienda will be served. Contact Clem or Fred at (808) 956-6086, email cps@hawaii.edu, or Tessie at (808) 595-6316, Ext 101. The trio are all professors from Mindanao State University. Dr. Ulindang will speak on “Migrants of Mindanao: Perils, Debacle and Recovery,” where she explores into the lives of second generation Mindanaoan settlers, particularly those whose parents were supported by government resettlement projects during the Commonwealth and Magsaysay administrations in the Cotabato provinces and Kapatagan, Lanao del Sur. Sporadic interviews also from the migrants themselves as well as written both primary and secondary sources are the main bases for this study. The Logic of Mother Language, the Ir/Rationalities of National Language, and Cultural Democracy in Action, by Aurelio Solver Agcaoili, PhD, UH Department of Indo-Pacific Languages and Literatures, January 23, 2013, 12:00-1:30 pm, Moore Hall 319 (Tokioka Room). Environmental Law in the Philippines, by Antonio A. Oposa, Jr., January 29, 2013, 11:45-1:00 pm, Moot Court Room, William S. Richardson School of Law. Language Choice and Accommodation Strategies of Filipino Women Married to Malays, Malaysian Chinese and Malaysian Indians, by Francisco Perlas Dumanig, PhD, Senior Lecturer, Faculty of Languages and Linguistics University of Malaya, Malaysia, February 12, 2013, 12:00-1:30 pm, Moore Hall 155A. Constructing Ilokano Identity in Rondalla Pedagogy, by Froilan Fabro, MA student (Ethnomusicology), UHM, February 13, 2013, 2:00-3:30 pm, Moore Hall 319. Jose Rizal and the Noli Me Tangere, A Century Hence: A Film and Lecture Series, sponsored by IPLL, CSEAS and CPS, April 5, 12, 19, 26, 1:00-4:00 pm, Hamilton 301. From Bonfire to Firewire: Ifiallig Orature Digitized, by Dr. Pia Arboleda, April 22, 2013, 3:00-4:30 pm, Moore Hall 319. Co-sponsored with Department of Indo-Pacific Languages and Literatures. What’s Next to the Bangsamoro?